Prior to my hiatus from blogging I was asked to review a fun looking book. It is a book written from a dog's perspective. It immediately caught me as something worth reviewing because how many times have I looked my pup in the eye and wondered what she was thinking. Also, lets be honest I often make a voice for my dog and speak dialog on her behalf. I read this book in a very short amount of time because it was just so stinking funny. It acts like a series of interview from 11 dogs, include Tinkerbell a spoiled Chihuahua, Orson a food crazed bulldog, Sophie an older cocker spaniel, and Sarge a Germany Shepard who is always looking for a new job. Not only were the dogs stories hysterically funny but some were touching as well. I loved stories of Orson talking about having to be a Vegan, or Tinkerbell discussing here life as a purse dog. The ones that touched me the most were the stories of the dogs who were rescues (all of my dogs have been) or Sophie talking about getting older and how she knows her owners are thinking about putting her down. I always wondered with my Doxie who I loved more than life itself knew how sick he was when we went to put him down. 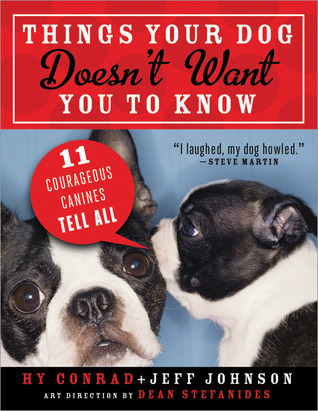 This was a hysterically funny book written by Hy Conrad who was originally a writer for Monk and Jeff Johnson an advertiser and board member of the Florida Keys SPCA. For any dog lover this was a great funny book about what our dogs think about us and how much smarter they are than we often give them credit for. I would give this five stars....truly one of the best comedy books I have read in a long time.